In-House group course rates are based on the individual participant public course rates. 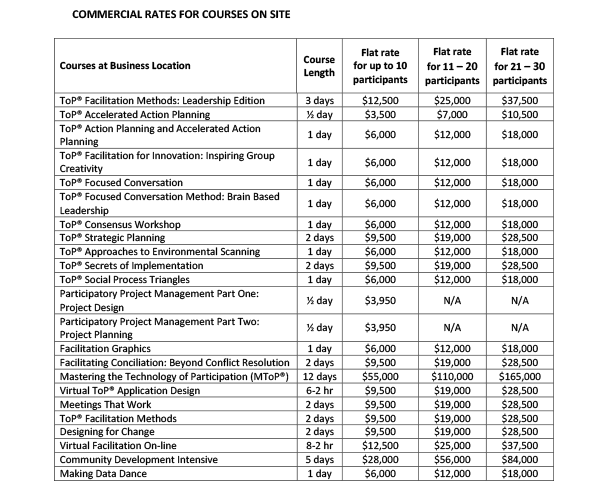 Flat rates are charged for all Tiers because of instructor requirements. In most cases, one instructor may train up to ten participants. Two instructors are required for 11 – 20 participants and three instructors for 21 – 30 participants. For example, a flat rate of $25,000 is charged for ToP® Facilitation Methods: Leadership Edition whether there are 11 or 20 participants. In-House courses are usually customized to meet the organizational needs. This may increase the price. Discounts are available to government and non-profit organizations. Please contact Nileen Verbeten at 916-705-1203 for discounts that may apply to your organization. ToP Facilitation Methods and ToP Strategic Planning courses are eligible for continuing education credit by the National Commission for Health Education Certification (13.5 CECH) and American Institute for Certified Planners (14.5 CM). Additional units are available for ToP Facilitation Method: Leadership Edition. Go to www.topspf.org or www.top-training.net to register of call Nileen at 916-705-1203.